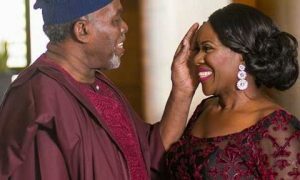 Nigerian veteran actress Joke Silva and her husband Olu Jacobs are unarguably celebrity marriage icon and a lot of people look upto them and wish to enjoy the marital bliss they are seemingly enjoying as they have been married now for 30 years. Interestingly this couple has successfully kept their marriage off social media so much that no one even knows the number of children they have together. Well,latest gist filthering in has it that Olu Jacobs’s birthday is today!the veteran actor turned 75 today and his adorable wife took to her Instagram page to gush about her husband as he is plus 1. In the 1980s Jacobs starred in several international films which include John Irvin’s war film The Dogs of War , Roman Polanski’s adventure-comedy Pirates (1986) and the family-adventure film Baby: Secret of the Lost Legend (1985). On television he was a cast in TVS ‘s The Witches and the Grinnygog (1983 series) and has starred in over 120 Nollywood films and is considered one of the top Nigerian Nollywood actors.